In response to rising interest from students, CoinDesk has compiled a list of the United States’ top blockchain universities. In recent years, universities around the world have invested heavily in developing curriculums and resources around blockchain technology. While it is impossible to evaluate all the intangibles that make a university the perfect place to learn about blockchain technology, this ranking aims to serve as a useful starting point for interested students. Cryptocurrencies and blockchain technology are notoriously difficult to teach because they are inherently interdisciplinary subjects, drawing on foundations in computer science, economics, law, and business. Recognizing this reality, CoinDesk attempted to measure the breadth of a each university’s activities, giving extra weight to interdisciplinary studies. Notably, CoinDesk does not evaluate the effectiveness of each program, only the scale of its blockchain related activities. The rankings only include universities in the United States, but CoinDesk recognizes the investments and leading roles of universities around the world. With these limitations considered, CoinDesk ranks the top US blockchain schools based on three key quantitative factors: the number of blockchain-related courses, the number of blockchain organizations on campus, and each school’s access to the blockchain technology industry. For example, a higher rank is indicative of a higher number of courses offered. For more information, please see our methodology. Topping our list, Stanford continues to build on its reputation as a well-rounded leader in the field. 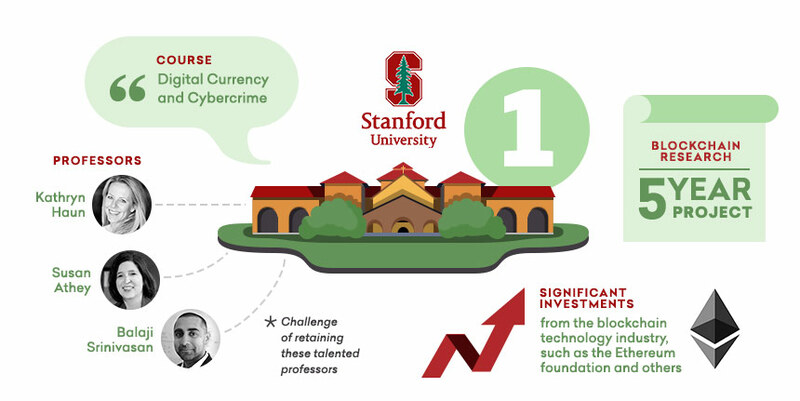 Past interdisciplinary courses like “Digital Currency and Cybercrime," have allowed students from Stanford’s renowned law, business, and computer science schools to collaboratively study the subject. Stanford has also established itself as a magnate for well-known professors in the industry. Kathryn Haun, a former federal prosecutor and now general partner at Andreessen Horowitz, taught a management class called “Cryptocurrency” alongside Susan Athey, a world-renowned economist. Other industry leaders have also found themselves drawn to Stanford. Balaji Srinivasan, the former CEO of Earn.com and current CTO of Coinbase, jointly taught a course on bitcoin in the computer science department. Furthermore, Stanford has attracted significant investments from the blockchain technology industry. The Ethereum foundation and others funded the Stanford Center for Blockchain Research, a five year project dedicated to working on the field’s many technical challenges. However, like all other schools, Stanford faces the challenge of retaining these talented professors as they continue to play a leading role in the development of the industry. 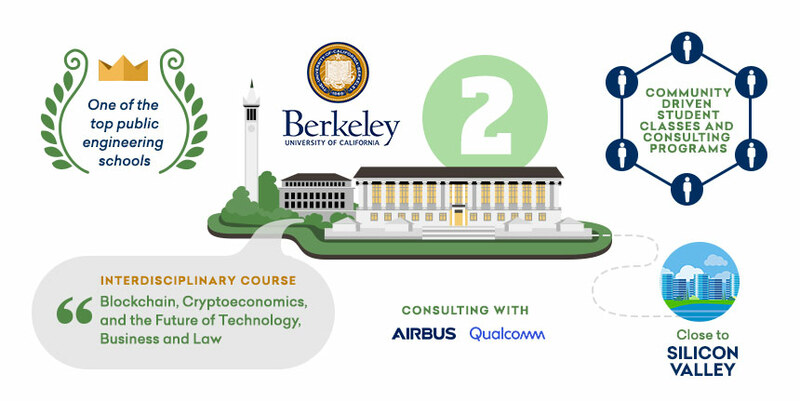 As the only public school in CoinDesk’s rankings, UC Berkeley demonstrates that universities can stay at forefront of emerging technologies without charging sky-high tuitions. Building on its reputation as one of the top engineering schools in the country, UC Berkeley offers several high-level computer science courses on the subject. However, the school also makes an effort to offer interdisciplinary education with courses like the aptly titled “Blockchain, Cryptoeconomics, and the Future of Technology, Business and Law.” This course, which draws professors from the business, computer science, and law schools, further cements Berkeley’s reputation as a leading educator. Perhaps most importantly, UC Berkeley benefits from one of the most vibrant on-campus communities in the country. The student organization Blockchain at Berkeley both educates and builds products, performing paid consulting work for major companies like Airbus and Qualcomm. Berkeley's law and business schools also boast their own blockchain related clubs. New York University was one of the first schools to offer a blockchain related course. Since 2014, professors David Yermack and Geoffrey Miller have offered the “Digital Currency, Blockchains and the Future of Financial Services” course, which focuses on “the emerging role of digital currencies and blockchains in money, banking, and the real economy. The Stern Business School’s “Applications in Entrepreneurial Finance: Fintech”, taught by Sabrina T. Howell, sheds light on the the financing dynamic of new blockchain ventures. NYU boasts some of the best extracurriculars for blockchain too. Early again, it held the first university supported bitcoin hackathon in 2014. It was hosted by the university supported Leslie Entrepreneurs Lab and partnered with companies: Chain and Blockchain. It also has the Blockchain Lab and Blockchain Digital Asset Forum as organizations bringing attention on campus. The city that never sleeps also provides access to an active ecosystem of blockchain startups nearby where students can get internships and jobs. For example, a short subway ride brings you to ConsenSys’ HQ which is a leader in ethereum based technology. Students interested in learning the technical underpinnings of cryptocurrencies and blockchain technology would be hard pressed to find a better option than MIT. With courses like “Cryptocurrency Engineering and Design” jointly taught by Tadge Dryja, co-author of the Lightning Network paper and the former CTO of Lightning Labs, and Neha Narula, director of MIT’s Digital Currency Initiative (DCI), students can gain exposure to the latest developments in the technology. Students can also benefit from MIT’s extensive bullpen of technical grandees who contributed to the foundation of core internet protocols, public key cryptography, and other key pieces of modern web infrastructure. Not to be left behind, MIT’s Sloan school of business offers courses like “Blockchain and Money,” exposing students to the business and regulatory implications of the technology. Cornell brings some top notch computer science courses to the mix with “Blockchains, Cryptocurrencies, and Smart Contracts”, taught by Ari Juels and Rafael Pass, and Distributed Consensus and Blockchains, taught by E. Shi. While students lead the Cornell Blockchain club on campus, a much more professional organization shares a connection to the school. The IC3, Initiative for Cryptocurrencies & Contracts, is an initiative of faculty members at Cornell and other leading educational centers like UC Berkeley and University College London. They seek to collaborate with domain experts in finance and banking, entrepreneurs, regulators and open source software communities to blockchains from the ideation to practical implementation. 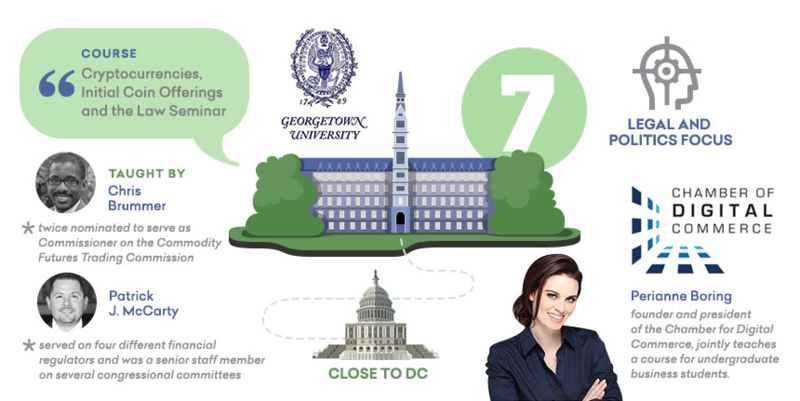 Georgetown University, a school known political science and business programs rather than its engineering prowess, finds its niche in the blockchain ecosystem by taking advantage of its connection to policy-making circles in Washington DC. The majority of Georgetown’s blockchain courses come courtesy of its law school, where students can register for courses like the “Cryptocurrencies, Initial Coin Offerings and the Law Seminar.” Chris Brummer, who was twice nominated to serve as Commissioner on the Commodity Futures Trading Commission, and Patrick J. McCarty, who has served on four different financial regulators and was a senior staff member on several congressional committees, teach the course. Perianne Boring, founder and president of the Chamber for Digital Commerce, jointly teaches a course for undergraduate business students. B-TED (Blockchain Technology and Ecosystem Design) Research Center launched early this year under NSF’s IUCRC program. 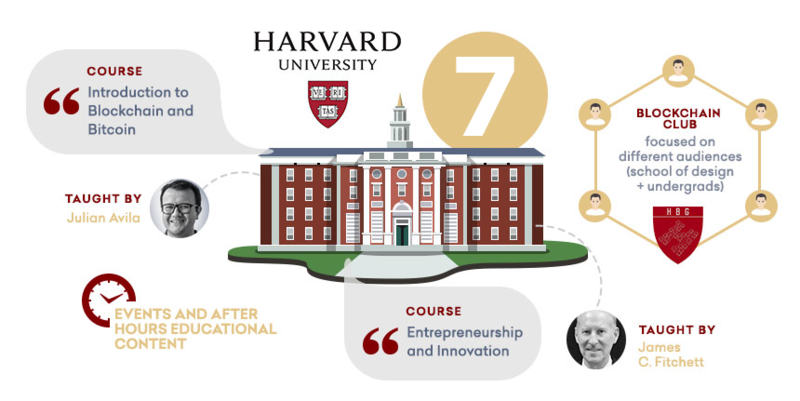 Harvard provides some courses in computer science like “Introduction to Blockchain and Bitcoin”, taught by Julian Avila, as well as having a business course with shared focus on blockchain called “Entrepreneurship and Innovation” taught by James C. Fitchett. The Harvard Blockchain Group and Harvard Undergraduate Blockchain Group help generate interest on campus through events and after hours educational content. The former focuses on students from the Graduate School of Design while the latter attracts the general underclassman population. 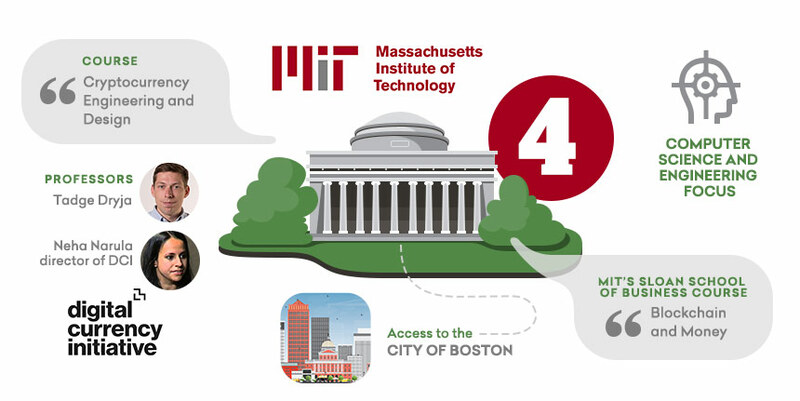 Harvard also provides a unique location to interact with partners in the educational space like MIT and businesses in the greater Boston area. Duke University’s blockchain program benefits from the pioneering efforts of a single business school professor, Campbell Harvey. In 2014, Harvey debuted the course “Innovation and Cryptoventures”. The course received a tepid initial response, but Harvey told Bitcoin Magazine that he expects that more than half of Duke’s Fuqua School of Business’s 2018 graduating class will have taken the course before graduation. The course set the stage for courses in other departments. Even students have gotten on board, with undergraduate students teaching a for-credit “house” course on blockchain technology. Harvey also helped found the Duke Blockchain Lab, a student led organization that brings together students, professors, and professionals. The lab provides a connection to the professional blockchain community, with many current members and former member of the lab working at leading companies in the industry. 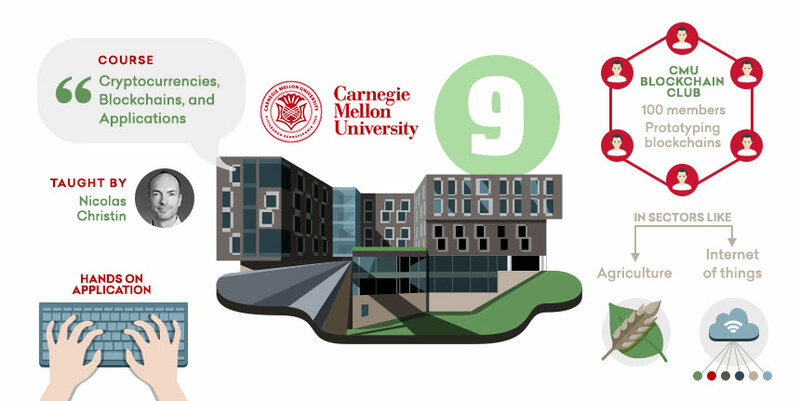 Carnegie Mellon University is renowned for the caliber of its engineering program. Blockchain courses have popped up in classrooms like “Cryptocurrencies, Blockchains, and Applications” taught by Nicolas Christin and Kyle Soska. The course covers the technological, legal, and business aspects of blockchain. The CMU Blockchain club offers students to prototype blockchain projects in different sectors from IoT to agriculture. The club currently boasts 100 members. 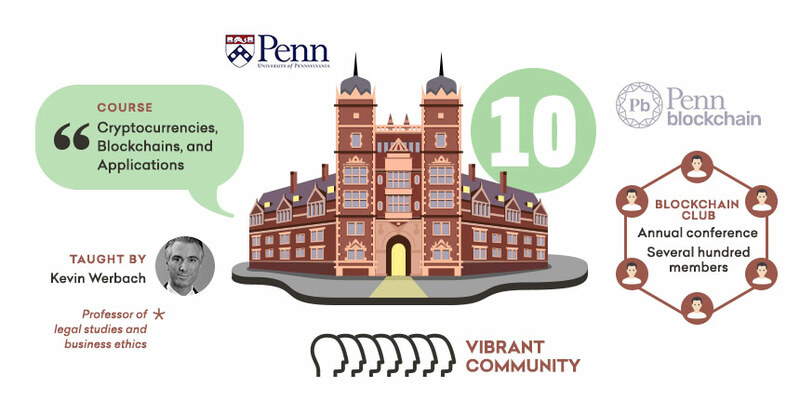 While the University of Pennsylvania does not yet offer as many courses as some of its peers, a core of early adopters on campus have helped create a vibrant community. Professors like Kevin Werbach, a professor of legal studies and business ethics, have helped foster the growth on campus. Support from professors, as well as substantial interest from students in Penn’s renowned Wharton business school, set the stage for the formation of the Penn Blockchain club, which boasts several hundred student members from various academic backgrounds and hosts an annual conference. CoinDesk ranks the top US blockchain schools based on three key quantitative factors: the number of blockchain-related courses, the number of blockchain organizations on campus, and each school’s access to the blockchain technology industry. CoinDesk places the most importance on the number of blockchain courses offered in the past year or currently on offer by each university. Blockchain technology remains a nascent field, and universities have struggled to find and retain professors qualified to teach the complex, interdisciplinary, and constantly evolving subject. It is worth noting that CoinDesk makes no attempt to evaluate the quality of each course, only whether the course covers blockchain related material. Consequently, courses devoted fully to blockchain or cryptocurrency receive one point, courses which prominently featured the subject receive a half point, and relevant executive education courses or online courses receive a quarter point. Interdisciplinary, blockchain-only courses that feature involvement from multiple departments receive a bonus half point. The second most important factor in CoinDesk’s rankings is the number of blockchain related organizations on campus. These organizations provide students the opportunity to engage in cutting edge research and get hands on experience working with the technology. CoinDesk does not distinguish between university sponsored initiatives such as dedicated research centers and student groups like blockchain clubs. CoinDesk Research evaluates each organization based on its impact, reach, and professionalism. The most influential organizations earn three points and the least influential groups earn one point. Access to blockchain networks comprises the final piece of CoinDesk’s rankings. While the blockchain technology industry often touts its accessibility, proximity to people and companies actively working in the sector remains a significant advantage. The meetups, events, and connections possible in the country’s blockchain hubs give interested students an easy access point to the industry at large. Using data from CoinDesk Research, we categorizes all US cities, with tier one cities being those with the most blockchain startup activity. Schools with easy access to tier one cities receive two points, those with access to tier two cities receive one point, and all others receive no points. To calculate the final ranking, CoinDesk normalizes the scores for each of the three factors by dividing each factor score by the maximum observed score in that category. For example, each university’s course score is divided by the highest recorded course score. The three factor subscores are then combined according to their respective weighting, yielding the final score for each university. It is important to note that all three factors of CoinDesk’s blockchain university rankings are likely to change over time. The scores in this report reflect data gather in August of 2018. If you believe that your university has added courses or clubs since August of 2018 or have comments about our methodology, please fill out this form or let us know at research@coindesk.com.